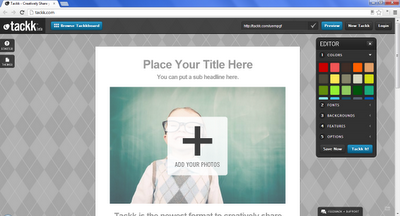 Tackk is a free web service that allows you to instantly and easily create and share content online. No login, no fees. Just go to the Tackk page and start typing. When you are finished, you can share it via the web or social networks. You can have a title, subtitles, photos, change fonts and colors, media, text and lists. It's great for quick messages and notices, as well as for other projects. Tackk about the upcoming class project, the next school event, and much more. It's free and easy to use and is a great way to communicate in education, as well as use for student and teacher projects. UPDATE: A reader asked if you could print your Tackk. I wasn't sure, so I Tweeted Tackk. They got back to me within a few minutes (that's quick service) and said you can. There is a print button at the bottom of the Tackk on the right next to the social media icons. Very happy to see how good their customer relations are.